After seventy-six full and eventful years, Betty has gone to her heavenly home on January 5, 2019. The last surviving member of her immediate family, she leaves behind a few relatives, but a host of longtime friends and “adopted family” members. Born October 9, 1941, she grew up in Ashby, the daughter of the late Michael and Mary (Young) McPhee. Betty was educated at Constantine and Holy Angels High School. In her early years in Sydney, she worked at Abbass Studios, MacVicars Pharmacy, Alfred’s Grocery store and of course, McPhee’s Bakery. Her summers were spent in Mira with her parents until she made Mira her permanent home in the late sixties. Her love of Mira and the water was unending. 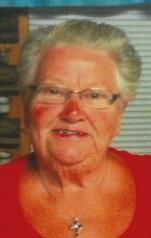 She was the Grounds Supervisor at the Albert Bridge School; she worked at Mira Convenience, and the Provincial Park. Her love of children was obvious and her favourite question to them was “Did you have fun?” That was the most important thing for them, to have fun. Betty has the ability to hear a song and sit at the piano and play it flawlessly. She loved to sing and loved to dance until her knees no longer allowed her to do so. Her faith in Jesus got her thru the hard times in her life and she had a special devotion to Padre Pio, Saint Theresa and the Blessed Mother Mary. She prayed for everyone. Betty leaves behind to mourn her, a lifetime of friends; a few relatives and her special cousin, Jean Marie MacNeil. Visitation will take place on Monday, January 8, 2018 from 7-9 p.m. at T.W.Curry Parkview Chapel. Funeral mass will be celebrated on Tuesday, January 9, 2018 at 11 a.m. at St. Joseph’s Church, Albert Bridge with Fr. Evo DiPierro officiating. Interment will take place at Resurrection Cemetery, Sydney Forks at a later date. Donations may be made to the Hospice Palliative Care Society of C.B. Regional Hospital.